Coconut oil is made of natural saturated fats in the form of molecules called medium-chain triglycerides (MCTs). Saturated fats increase the healthy cholesterol in your body (called “HDL cholesterol”) and help convert bad cholesterol (“LDL”) to good cholesterol. Increasing “HDL” cholesterol can help promote heart health and lower the risk of heart disease. Simply pure, cold-pressed and not refined coconut oil contains at least 62% medium chain triglycerides (MCTs). MCTs is high in metabolism and turns into energy. This means Coconut oil helps in weight loss. Coconut Oil has so many benefits to us in addition to dogs and cats. However CNN had an article about ‘Is Coconut Oil Healthy’ and it discusses about HDL and LDL cholesterol. You may want to check with your doctor in regards to coconut oil related to heart health. Below are some of the Benefits that I am aware of and have experienced using coconut oil. Cooking with Coconut Oil can help prevent or treat Dementia and Alzheimer’s because of how MCTs are broken down into molecules the brain can use as fuel). I have seen this happening to a friend’s Mom who has Alzheimer and cooking with Coconut Oil does help. Many household uses vegetable oil, canola oil, olive oil. Olive Oil is also healthy to cook with. However, Olive Oil burns faster than Coconut Oil. Coconut Oil has many benefits when consumed. You can fry any food item with Coconut Oil. I have personally done this. I used Coconut Oil to fry eggs, vegetables, meat. You may also put Coconut Oil in steamed rice. Some coconut oil is odorless and clear. 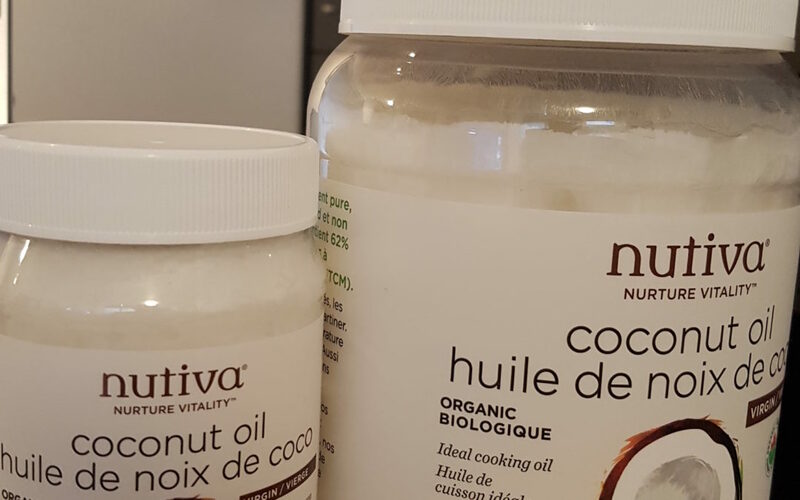 The brand that I used ‘Nutiva’ Coconut Oil is Organic, Unrefined, Cold-Pressed, Virgin. I stock up on coconut oil. I have 2 bottles of 1.6L and a small 444ML bottle. When I travel, I bring the small coconut oil bottle with me as sometimes I can’t bring my waterpik with me due to different voltage in the country I travel. However, the last time I went to Grenada and brought the small bottle, my luggage was searched and somehow the coconut oil bottle was cracked and the oil spilled out in my luggage. I would recommend to pack it properly in Zip Lock bags and also in another plastic bag just in case it spills. You can also put a teaspoon of Coconut Oil in your Coffee in the morning. Click “Best Coconut Oil ” to find the Best Coconut Oil for sale on Amazon.ca. 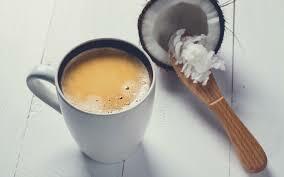 What I do every morning after waking up and before brushing my teeth, I would start “Oil pulling” with coconut oil. I take out a tablespoon of coconut oil and swish the oil in my mouth for 10-20 minutes. It depends on the temperature in your house. Coconut oil is solid at room temperature and melts at 24 degrees celcius. If it is solid when you swish, then chew on it until it melts in your mouth, then gargle/swish. I normally leave the coconut oil in my mouth and swish while I jump in the shower. That way I can multi-task and save time getting ready in the morning. Make sure you don’t swallow any of the oil in your mouth as it contains all the bacteria. After 10-20 mins of swishing, I spit the oil out in the sink. I did some research and it seems like it is best to spit the oil in the trash as the oil could clog up the plumbing. I am going to start spitting out in the trash starting tomorrow. Then I immediately rinse with warm water and brush as normal. Oil pulling with coconut oil gets rid of bacteria in your mouth and prevents gingivitis. It also gets rid of bad breath. I do this every morning 7 days a week and it really helps my gum and whiten my teeth. Dr. Axe has a video on how to do Oil Pulling with Coconut Oil. Click on “Oil Pulling with Coconut Oil” to watch the video. 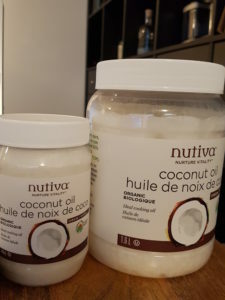 What I do every time after I wash my hair, I would scoop out 1/2 a teaspoon of Coconut Oil in the palm of my hands and rub myhands together until the Coconut Oil melts in my palm. Then I massage my scalp and hair with a handful of Coconut Oil. I have colored hair. This makes my hair shiny, prevent dandruff and also makes my hair color lasts longer. My hair dye lasts up to 2-3 months before I dye it again. People said that you can also mix Lemon with Coconut Oil if you want to turn Gray Hair back to its Natural Color. I am not sure if this mixture works as I have not tried it yet so I can not speak for it. I also apply Coconut oil on my skin when it is dry. I used Coconut Oil as my lip balm. This helps moisturizes my chapped lips. My friend uses Coconut Oil on his son’s skin as his son has Eczema. As per conversation with him, he said it helps his son. If you have a baby/toddler, you can also use this on their skin as natural moisturizer. My sister applies this on my nephew’s skin and hair since he was a baby and is still applying it on him when he is 20 months old. It helps him grow his hair. You can basically use Coconut Oil on any part of your body. Coconut Oil also helps with Athlete’s foot odor if you mix Coconut Oil with Tea Tree Oil. Hopefully you find this article about the Benefits of Coconut Oil helpful. I have been using Coconut Oil for over 7 years. The best thing to find out about Coconut Oil is to get a bottle and try it out yourself and take advantage of the benefits to your health, skin and hair. Tips: Before you start cooking with coconut oil, try a little bit first and see if you have reaction to coconut oil. If you are allergic to coconut oil, then don’t cook with it. You can still use it as mouthwash and apply to skin. Introduce a little at a time to test it out.